I'm not going to lie, I was a little concerned going into The Coldest Girl in Coldtown. I've been mildly burnt out on YA recently, with many of the current reads seeming vaguely formulaic. The biggest thing that constantly bugged me was the inevitable love triangle between the heroine and the two (predictably) hot guys, one being the friend who may or may not be already involved with the heroine, and then the "bad" guy, who may or may not actually be bad, but is clearly out of the heroine's comfort zone. A fellow reader told me that Coldest Girl was not like that, yet when the book opens with our heroine, Tana, waking up after a party to find everyone in the house dead with the exception of her ex-boyfriend and another vampire, I immediately thought, "Sigh. Another love triangle. And so soon!" I trust my friend, though, so I persevered and continued on without setting the book down after the first couple of chapters, and I'm not disappointed I did. Black constructs some nice world building around her vampires and what it takes to infect a person and turn them into a vampire. Instead of an instantaneous transformation, humans can come down with an infection, known as going Cold, and it is possible to fight off the infection and not turn. Yet, if an infected human drinks human blood, then they will turn into a vampire. In order to quarantine both those infected and turned, certain cities across the country are walled off (known then as Coldtowns) and those inside try to get by as best they can. Like most of Black's stories, this isn't a fairytale world. These Coldtowns are dirty, grungy, dangerous places with their own sense of glamour and beauty. Tana proves to be a strong protagonist throughout, not generally needing help from others. This was refreshing, as is the fact that this is a stand alone story. Black seems to have intentionally tried to downplay anything that makes for a "typical" YA paranormal story these days: Trilogies. Strong, but not strong, female protagonists. The love triangle. All of these things are almost there, but she pulls back before toppling too far into that territory, and for that I'm thankful. Black's writing again leaves me in a love/hate relationship. Her writing is solid and clear, yet it always leaves me wanting. I'm never quite sure what I want, but it always seems that whatever that "thing" is that will push me over the edge to simply loving her writing is always just out of reach for me. The Coldest Girl in Coldtown is really good storytelling, and fans of her work shouldn't be disappointed and should be a good introduction for those not familiar with her work. 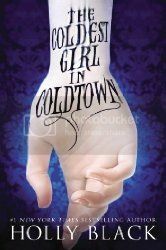 The Coldest Girl in Coldtown is one of my favorite vampire reads. The story is amazing and ignores the tired tropes of the genre. Although there is a slight bit of romance, it in no way overpowers the story. I had to find out what happened and found myself staying up way too late and forgetting to do things to read more. Holly Black writes the best books in each genre she writes in and I will read anything she writes.